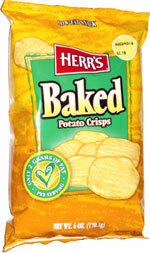 Taste test: At first glance, I figured these were the Herr's version of Baked Lay's. In fact, several people thought these were Baked Lay's when they saw the bag in the chip bowl, as there is a definite resemblance in the bag design. 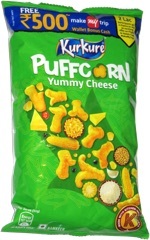 But once anyone looked inside the bag, it became clear that these were not like Baked Lay's at all. The chips were loosely hexagon-shaped, like Baked Lay's, but the resemblance ended there. These looked like very thin crackers, complete with a geometric pattern of tiny holes. The taste and texture were a lot like a cracker, with a few brittle layers and some air in between. Upon biting in, there was a very light feel to the crisp. Unlike crackers, the taste was sort of potatoey, but it wasn't even close to the taste of a potato chip, and it wasn't much like a Pringle/Baked Lay either. So these had a taste all their own. They didn't taste bad, but nobody was excited about the overall experience. Smell test: Very mild cracker-like smell.